Shooting Star (Discovery Level 2). 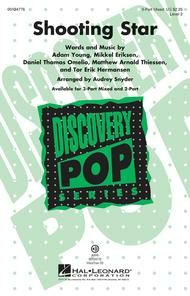 Composed by Adam Young, Daniel Omelio, Matthew Thiessen, Mikkel Eriksen, and Tor Hermansen. Arranged by Audrey Snyder. For Choral (3-Part Mixed). Discovery Choral. 16 pages. Published by Hal Leonard (HL.124776).It's time for you to shine! The fresh sounds of Owl City continue to delight fans across the globe. Young singers will love recreating the music with this accessible arrangement! Available separately: 3-Part Mixed, 2-Part, VoiceTrax CD. Duration: ca. 3:15.